RDJ Tax Partners launch Revenue Audits and Investigations Handbook published by The Irish Tax Institute. RDJ Tax Partner, Mark Barrett is co-author of "Revenue Audits and Investigations – The Professional’s Handbook" a new publication by The Irish Tax Institute. The book provides expert commentary and insights from practitioners who use the Code on a daily basis and is designed to aid and guide practitioners through the audit process. The book was written and edited by Mark Barrett; Clare McGuinness, Irish Tax Institute (formerly RDJ) and Julie Burke Tax Partner, RDJ. It provides a one-stop source of practical, legislative and procedural guidance for those handling Revenue audits in their day-to-day work. The book is available to order directly from the Irish Tax Institute here. 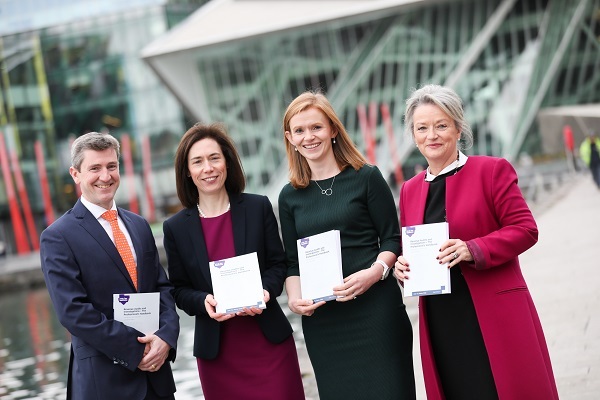 Pictured above at the recent launch are: (l-r) Mark Barrett, author & Tax Partner, RDJ; Marie Bradley, President, Irish Tax Institute; Clare McGuinness, author & Irish Tax Institute and Julie Burke, editor & Partner, RDJ.